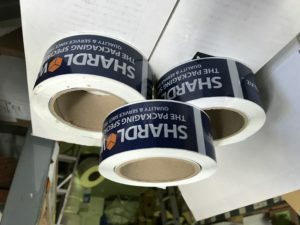 Get your company logo printed on your everyday Packaging Tape. You don’t have to buy huge quantities. A minimum of 2 cartons or 72 rolls is all you need to get your own branded packaging tape. Start with a basic white 48mmx100m polypropylene tape and get either a 1,2,3 colour print. The cheapest option is to go for a 1 colour print as you will need to pay for a one off plate charge per colour. It also gets a bit cheaper, the more rolls you buy, with discounts at 180 rolls and 360 rolls. The price is a bit more expensive per roll when you go for 2 and 3 colours and the plate charges are roughly double and triple for 2 and 3 colours. Approximately, 4 weeks lead time and artwork to be supplied as a PDF or eps file.